The Instant Pot Ultra is Instant Pot’s most powerful multi-use cooker, and the 8-quart model is the biggest version of the Ultra that the company makes. Today, the stars have aligned because Amazon gave the king of Instant Pots a deep discount for one day only. 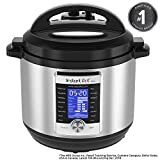 That’s right, the Instant Pot Ultra 8 Qt 10-in-1 Multi- Use Programmable Pressure Cooker is on sale on Monday for just $119.95. That’s a savings of $60 and it makes the 8-quart model $30 less expensive than the smaller 6-quart model! This sale is a definite sellout risk, so grab one while you can.